Miriam is one of the three young peregrines from the Richmond Hill hack release in August 2003. She was fitted with a satellite transmitter on August 15, 2003, and the data received from her will be documented on this page as reports are received. December 28, 2003: 42.4N, 83.3W (Dearborn Heights MI). Miriam is back on the move, having flown 170 km west over the past four days to reach the western side of Detroit. December 24, 2003: 42.7N, 81.2W (Port Stanley ON). For the first time in roughly two months, Miriam appears to have remained stationary between reports. December 20, 2003: 42.7N, 81.2W (Port Stanley ON). Miriam has reversed course, returning to the north shore of Lake Erie. This time she is in Port Stanley, just a couple of kilometres west of Hawk Cliff, where large numbers of peregrines pass each fall during migration. December 16, 2003: 43.1N, 81.9W (Forest ON). Another west-northwest shift by Miriam has brought her to near Forest, Ontario. She is now within 10 kilometres of Lake Huron, and will have to change direction soon, if in fact she keeps moving. December 12, 2003: 43.0N, 81.3W (London ON). Miriam continues to move west, with her latest signal indicating she is now on the western edge of London, Ontario. December 8, 2003: 42.8N, 80.0W (Port Dover ON). Buffalo must not have impressed Miriam - today she's back at almost the same spot as on November 30. December 4, 2003: 43.0N, 78.9W (Buffalo NY). Miriam has finally crossed the border for the first time (that we know of), reporting to us from a bit north of downtown Buffalo, New York. November 30, 2003: 42.8N, 80.0W (Port Dover ON). Back to Lake Erie ... Miriam is several kilometres east of Port Dover, right along the Lake Erie shoreline. November 26, 2003: 43.5N, 80.5W (Waterloo ON). Still on the move, Miriam has swung back north, and reported to us this evening from the north end of Waterloo. November 22, 2003: 42.9N, 80.1W (Jarvis ON). For the first time Miriam has left the Greater Toronto Area - perhaps she is considering migrating before winter hits after all. Her latest report is from Jarvis, near where 15114 was back in August. November 17, 2003: 43.6N, 79.6 (Mississauga ON). Today Miriam has swung west again, and is currently near the home of the Mississauga Centre peregrines. November 13, 2003: 43.7N, 79.4W (North York ON). Miriam continues to move around Toronto. Today she is in central North York, on November 9 she was along the Etobicoke lakeshore, and four days before that, right in the heart of downtown Toronto. October 28, 2003: 43.6N, 79.5W (Etobicoke ON). Miriam is back in Etobicoke again, in the area of Humber Bay. October 24, 2003: 43.2N, 79.8W (Hamilton ON). Looks like Miriam has become yet another in a long list of peregrines to pay a visit to Hamilton - her signal this evening came from the downtown area, so she may have encountered one or both members of the local pair. October 20, 2003: 43.6N, 79.5W (Etobicoke ON). Miriam remains in Etobicoke, this time somewhat southeast of the Clarica Centre nest site. October 16, 2003: 43.6N, 79.5W (Etobicoke ON). 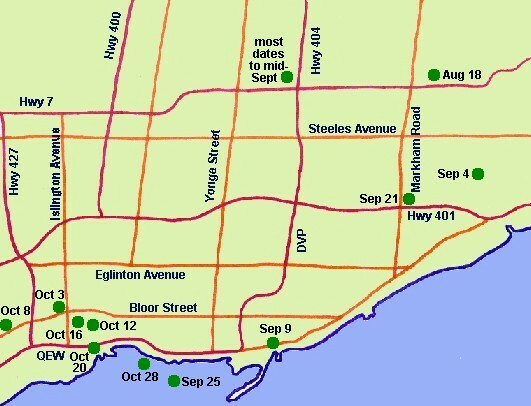 By October 12, Miriam had shifted over to the area near the Etobicoke peregrine nest site, and as of today she remains in the area. Interesting that she is being attracted to already occupied sites. October 8, 2003: 43.6N, 79.6W (Mississauga ON). Miriam today paid a visit to the territory of the Mississauga Centre peregrines. September 30, 2003: 43.2N, 79.0W (Queenston ON). For the first time, Miriam finds herself on the other side of Lake Ontario. Her position is along the Niagara River, several kilometres downstream from the falls. September 25, 2003: 43.6N, 79.4W (Toronto ON). Today's report from Miriam places her near Sunnyside Beach, just east of Humber Bay park, an area where peregrines have been seen occasionally in the past. September 21, 2003: 43.8N, 79.2W (Scarborough ON). Miriam remains restless, this time heading back to Scarborough, a bit northeast of the Scarborough Town Centre. September 17, 2003: 43.8N, 79.4W (Richmond Hill ON). It seems that Miriam has decided not to give up on home quite yet - for the past week her reports have again come consistently from the area around the Richmond Hill Town Hall. September 9, 2003: 43.7N, 79.3W (Toronto ON). Miriam has moved close to the east side of downtown Toronto, near the base of the Leslie Street Spit / Tommy Thompson Park. Interestingly, Rouge (from the first year of hack releases in Richmond Hill in 1999) also visited this area. September 5, 2003: 43.8N, 79.2W (Scarborough ON). So far at least, Miriam is somewhat more active than her brother Richmond. As of today, she is in northeast Scarborough, near the Toronto Zoo, while her previous report on August 31 came from Aurora, to the north of Richmond Hill. August 27, 2003: 43.8N, 79.4W (Richmond Hill ON). Not surprisingly, the data show that Miriam has stayed in the general vicinity of the Richmond Hill Town Hall over the past couple of weeks.